I guess I can take credit for making one of my own and serving as an inspiration. 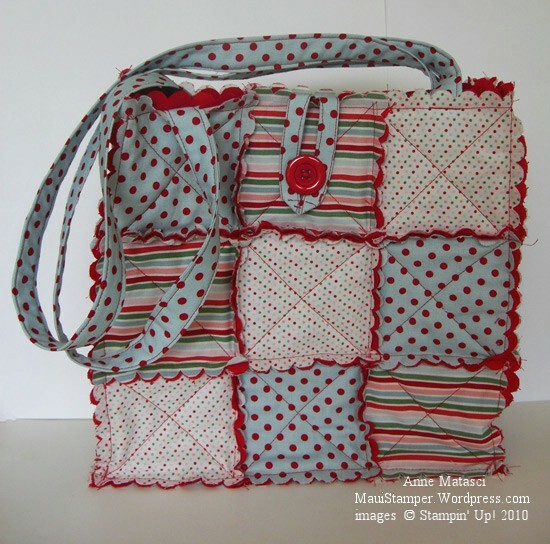 This is Kellie’s Candy Cane fabrics Scallop Square bag and I love it. She let me borrow it for display purposes only and was VERY careful to tell me that she wanted it back. Smart girl. Angie Kennedy Juda has a great tutorial video on making this bag if you’d like to have one of your own. My bag has the added benefit of being constructed with the help of Captain Stupid Head himself, who is sleeping right next to my computer monitor at this very moment. It’s one of his favorite spots and he is happy unless I have technical issues that cause me to shout and/or pound the desktop.